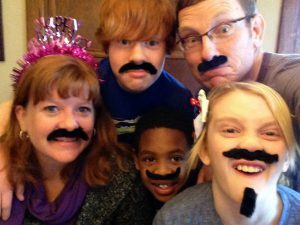 For my husband Kent and me, adoption was always an option as a viable way to expand our family. When we were first married, we had the opportunity to foster two sisters which gave us a chance to better understand the foster care/adoption process and the needs of the children in foster care. After having two biological children, Kaleb and Rosie, we decided that we would not have any more biological children, but adopt from foster care in the future. In the winter of 2013, we moved forward with the adoption process. I wouldn’t be truthful if I didn’t say, it wasn’t daunting. When our caseworker started discussing some of the challenges and needs of the children as a result of the abuse and neglect they have suffered, it was a lot to take in. In fact, I had a friend say, “Don’t do it.” But we remembered our foster daughters and how despite their circumstances, at the end of the day, they were just two wonderful kids. With that said, my husband and I also had many discussions about who we are as a family and who we are not. Inasmuch as our hearts wanted to lead this journey, we had to make sure we were not acting on our pure emotion. We had to consider our two children, our lifestyle and our family dynamics. For example, when we would read about a child who likes a quiet environment, we had to admit to ourselves that our house is the opposite of quiet. We are a very spirited family! With Jermaine we realized how powerful the word “forever” was. After placement, we found that as Jermaine became more comfortable in our home, a lot of his challenges lessened and his confidence grew. For those starting the adoption journey, it will feel like a very long climb to the top. You feel you have made this decision to adopt and now you have to do all this paperwork, classes, home study, etc. Not unlike a pregnancy, it can seem like a long trek until your child arrives. On the other side of that long ascent is what feels like a very fast decent into your expanded family. But like a rollercoaster, it’s exciting and joyful. I would recommend to anyone pursuing adoption to read, read and read about adopting from foster care. It helped us to be prepared and to prepare our family. No matter how much excitement we felt after taking placement of Jermaine, it wasn’t all rainbows and lollipops because we had three kids who all had preconceived notions about each other. For our biological children it was that Jermaine would be so grateful that we were “giving” him a home and he was “getting” a brother and sister that he would do whatever they wanted. For Jermaine, it was that an older brother would never get tired of playing with his younger brother and do whatever he wanted. I remember that Rosie was so excited to have Jermaine come visit the first weekend until he told her that he didn’t want a big sister – just a big brother. Crestfallen, she moped off grumbling, “I don’t like him.” Happily, Jermaine has figured out that having a big sister is as much fun as a big brother, (especially when that big sister is Rosie!). Also during those first months, Kaleb and Rosie didn’t always understand why Jermaine needed so much of our attention and as parents we learned that kids may cognitively understand something but not necessarily emotionally understand it. Kent and I took a lot of time to try and make sure that each kid got some one-on-one attention and to keep an open door for all kids to discuss the adoption. I think the hardest question we got asked by our birth children was, “Weren’t we good enough?” Of course, we stated that they were so good, so great, that they showed us we had room in our hearts for another child. In April 2014, a little over a year after starting our adoption journey, we finalized our adoption with Jermaine. It’s amazing because in such a short amount of time, we have watched our family go from four to five and at the same time, it feels like it was always meant to be. We have gotten to do so many firsts with Jermaine and have watched him mature and settle into the family. Amazingly, all the kinks between the kids have worked out with time. They still have their moments, but I’ve noticed all the kids refer to each other as brother and sister in conversation and the word “adopted” has been dropped. For us adoption was the best way to expand our family. Our children are amazing and I can’t imagine our family without Jermaine.